KATHMANDU, April 10: The latest edition of the World Economic Outlook (WEO) from the International Monetary Fund (IMF) has projected Nepal’s economy to grow by 6.5 percent in the current fiscal year – FY2018/19. According to the WEO released on Tuesday during the ‘2019 Spring Meetings of The World Bank and the International Monetary Fund’, the gross domestic product (GDP) of Nepal is anticipated to grow by 6.5 percent in the current fiscal year and 6.3 percent in the next fiscal year 2019/20. The WEO’s projection is a reiteration to the recent forecast of its ‘Article IV mission’ that visited Nepal in December last year. The government has kept economic growth target at 8 percent in the current fiscal year. The IMF is considered to be an institution to keep conservative growth projection compared to other multilateral institutions. However, this time the IMF’s projection is the highest among those who have made public their growth forecast of Nepal. 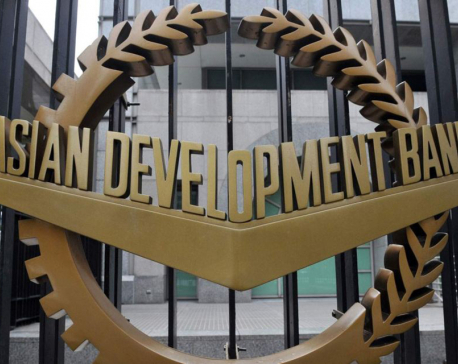 On Sunday, the World Bank said that the economy of Nepal is projected to grow by 6 percent in FY2018/19, while the Asian Development Bank (ADB) said in the first week of April that Nepal’s economy is anticipated to grow by 6.2 percent in the current fiscal year. Previously, in its Article IV mission’s report, the IMF had said that the growth is expected to reach 6.5 percent supported by greater political stability and a more reliable supply of electricity. However, the mission had also cautioned Nepal about the risk of higher growth, stating that the current economic expansion also comes with some challenges that need to be carefully managed. “It is the IMF team’s assessment that a measured tightening of policies is warranted to safeguard macroeconomic and financial stability,” read the report of the mission. Meanwhile, the IMF’s latest WEO has said that weakened global expansion in the second half of last year is likely to persist in the first half of 2019. “..our new World Economic Outlook projects a slowdown in growth in 2019 for 70 percent of the world economy. Global growth softened to 3.6 percent in 2018 and is projected to decline further to 3.3 percent in 2019,” said Gita Gopinath, chief economist of the IMF, releasing the report. She said escalation of US-China trade tensions, needed credit tightening in China, macroeconomic stress in Argentina and Turkey, disruptions to the automobile sector in Germany, and financial tightening alongside the normalization of monetary policy in the larger advanced economies have contributed to the softening in the global growth.